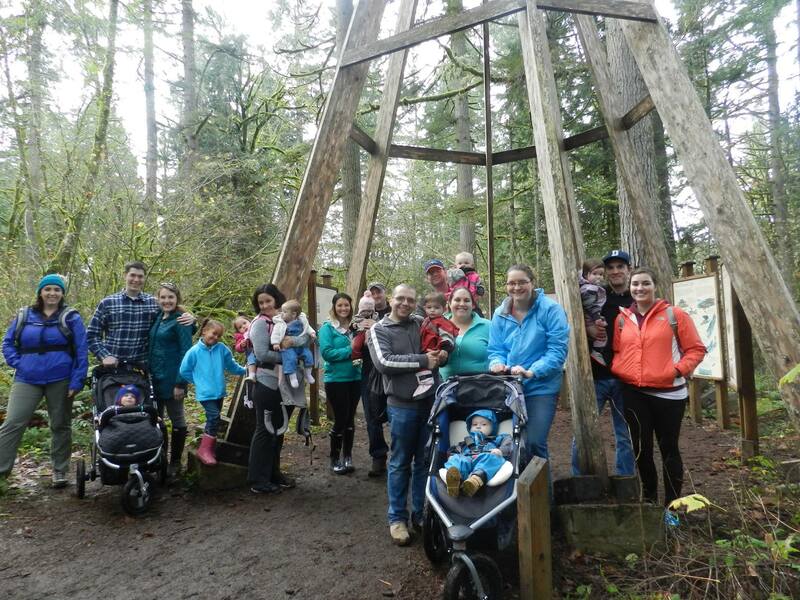 Recently Hike it Baby Olympia did a trip to Kennedy Creek Salmon Trail and encouraged the whole family to participate. Photo courtesy: Hike It Baby Olympia. Cold, rainy days can be hard on even the strongest Washingtonian, but what if you have a new baby or toddler at home? Suddenly, your options get even more limited. 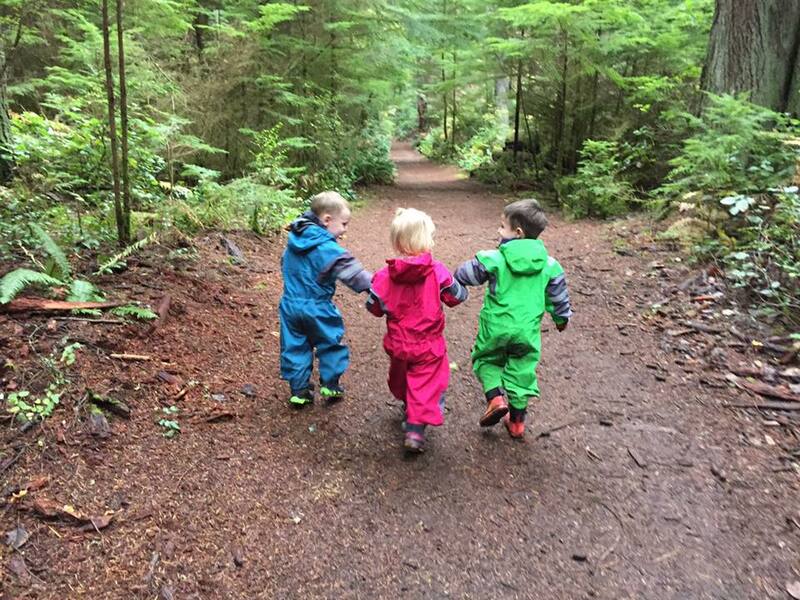 Hike it Baby Olympia is here to help you beat cabin fever. The national, non-profit organization Hike it Baby started just over three years ago in Portland as a way for parents to get outside with their children. 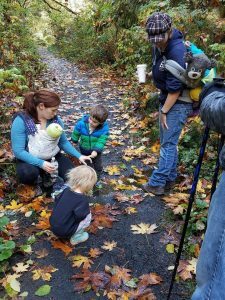 With more than 300 Hike it Baby groups across the country, and a few popping up internationally, many more people are joining in the fun. Hike it Baby has more than three-hundred branches worldwide now. Photo courtesy: Hike It Baby Olympia. For local Olympia branch ambassadors and friends, Anna Boechler and Jessica Foster, it was a great way for these military wives to meet new people and get to know the Pacific Northwest. “There’s so many mommy and me type things, indoors, story times, and yoga. I just wanted to get outside and do something you don’t do every day. And it was so easily accessible to me. You just show up,” Jessica shares. 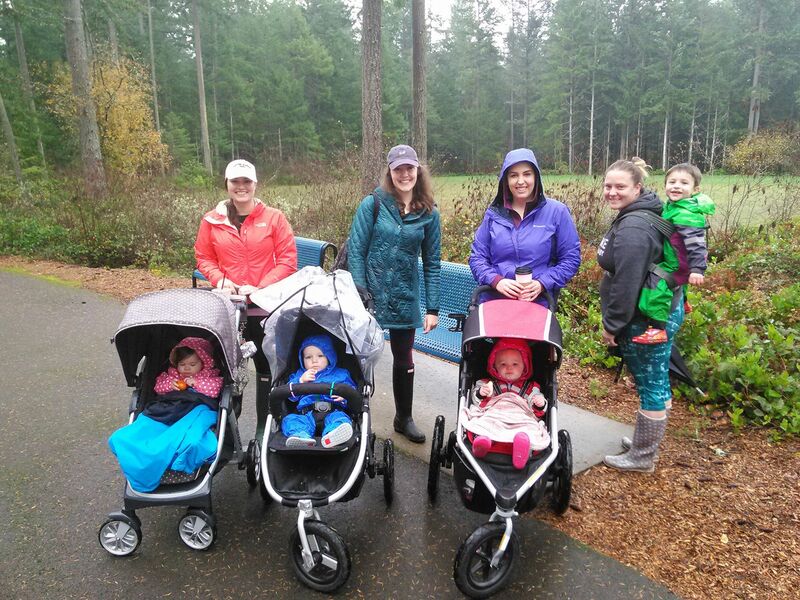 Branch ambassadors Anna Boechler (second from left) and Jessica Foster (second from right) lead the Hike it Baby Olympia group. Photo courtesy: Hike It Baby Olympia. Anna says for her it was all about finding something unique to do and getting adult interaction too. “I think I just liked the idea behind it. 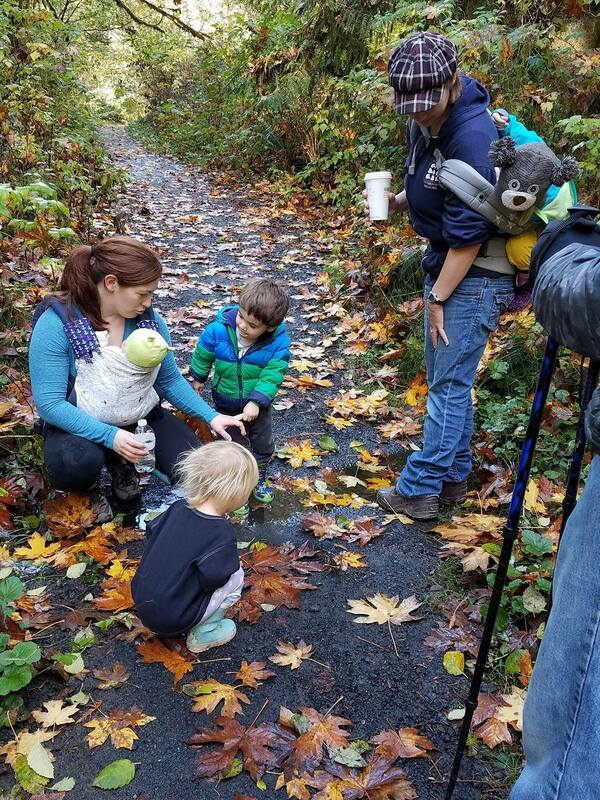 We have a motto, ‘No Hiker Left Behind,’ and it really empowered me as a new mom. Yes, I might not be as fit as I once was, and I might be dealing with a diaper blow out or need to nurse, but I’m with a tribe of people that all understand me. I can get outside with my kid and it will be ok,” says Anna. Anna explains how friendly the group is even if it is your very first hike and you don’t know anybody. That’s why they begin every hike with a welcome circle where parents introduce themselves, their child, and where they are from. It is an easy way to break the ice and see what you might have in common others in the group. 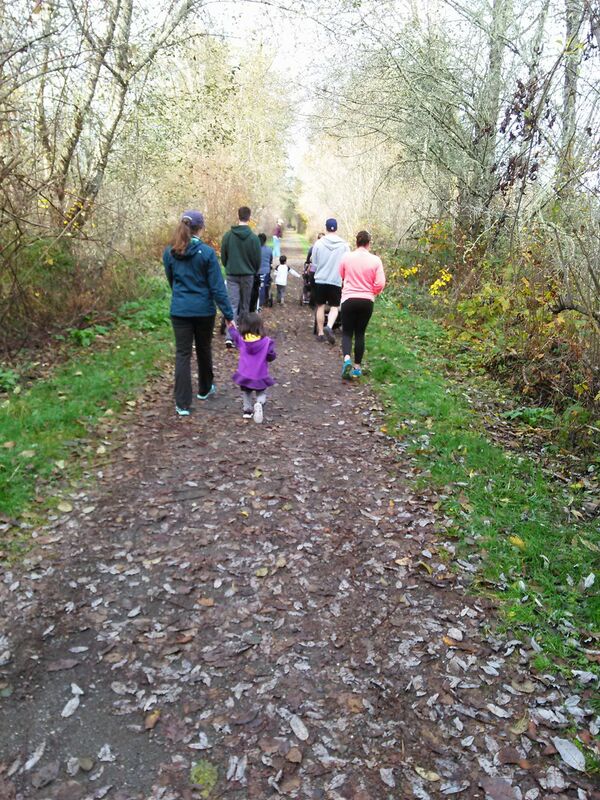 Hikes are geared towards parents with small children, but kids of all ages are welcome. Photo courtesy: Hike It Baby Olympia. Hike it Baby Olympia offers a variety of hikes for all different levels and situations because, as Jessica tells me, “The biggest thing is to get kids and families out in nature.” And you can bring your older kids as well. The group tries to do at least one hike a week, and they vary from walks around town to more rugged outdoor adventures. What’s great is their calendar tells you exactly what to expect, including restroom availability, parking details, length of hike, and whether it’s a stroller-friendly and/or dog-friendly hike. The non-profit organization says they aim for at least one hike a week and you can find the schedule on their calendar. Don’t worry if you don’t have a bunch of outdoor gear for your kids. Hike it Baby Olympia is able to help. Whether it’s borrowing an umbrella or even a backpack for the day, they’ve got you covered. Anna and Jessica say because Hike it Baby has spread all over the country, it’s great to join other branches as well. If you are traveling to a new area, you can get tips on where to go and what to explore. “We’re not only connected to like-minded parents who want to get their kids outside in the Olympia area, but also nationally we see what people are doing in Alaska and what they are doing in Florida,” Anna explains. She says as group leaders they often just like to see what other areas are doing and get fresh ideas to use here. It’s one big network, all with a common goal, getting families outside together. You can find Hike it Baby Olympia on Facebook, but they are a closed group so you will need to ask to join the group to see all their posts.